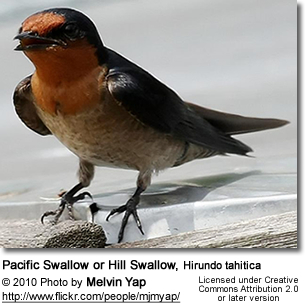 The Pacific Swallow or Hill Swallow (Hirundo tahitica) is a small passerine bird in the swallow family. It breeds in tropical southern Asia from southern India and Sri Lanka across to south east Asia and the islands of the south Pacific. It is resident apart from some local seasonal movements. This bird is associated with coasts, but is increasingly spreading to forested uplands. 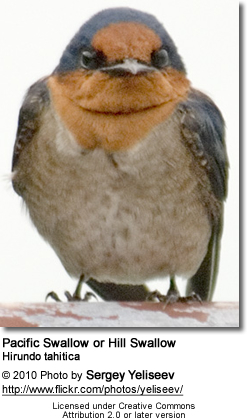 This species is a small swallow at 13 cm. It has a blue back with browner wings and tail, a red face and throat, and dusky underparts. 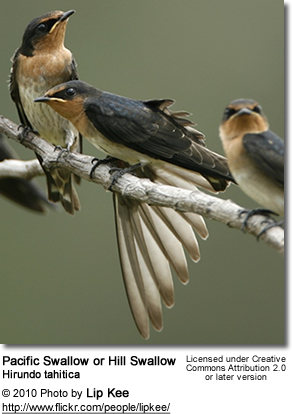 It differs from Barn Swallow and the closely-related Welcome Swallow in its shorter and less forked tail. 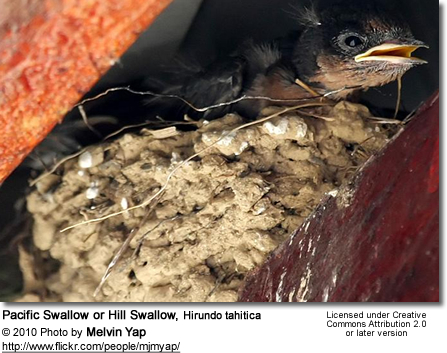 The Pacific Swallow builds a neat cup-shaped nest, constructed with mud pellets collected in the beak, under a cliff ledge or on a man-made structures such as a building, bridge or tunnel. The nest is lined with softer material, and the clutch is two to three eggs, up to four in Sri Lanka. 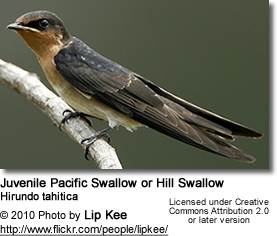 It is similar in behaviour to other aerial insectivores, such as other swallows and the unrelated swifts. It is a fast flyer and feeds on insects, especially flies, while airborne. Turner, Angela K; Rose, Chris (1989). 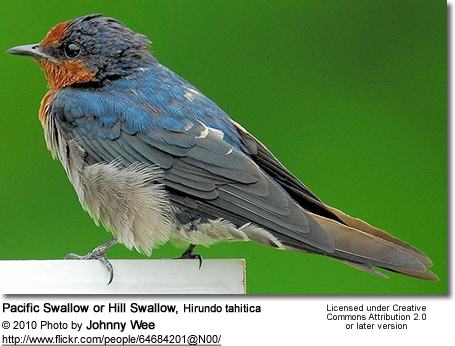 Swallows and martins: an identification guide and handbook. Houghton Mifflin. ISBN 0-395-51174-7. Grimmett, Richard; Inskipp, Carol; Inskipp, Tim (2002). Pocket Guide to Birds of the Indian Subcontinent. London: Christopher Helm Publishers Ltd. ISBN 0713663049.